And there it was, she could see it now. To her tired eyes, the hustle bustle of the Gateway of India was muted. All they could hear was the melodious red of The Taj..her Taj. 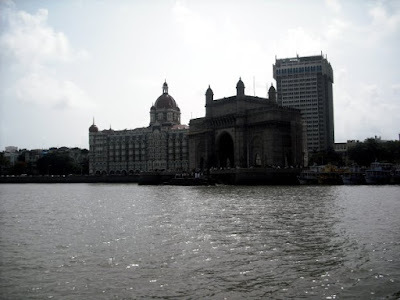 Every time their ship came to Mumbai, her 5 year old feet couldn't wait to get onto the lurching boat that would take them to the shore at the Gateway of India, right behind which stood the object of her fantasy. Taj, with its gigantic walls, majestic windows, cool marble floors, leveried waiters who always treated her like the princess she knew she was, and most of all the breathtaking fountain right in the middle of its shiny lobby, which she loved to dance all around, was truly her haven. And as the boat neared the harbour and the half naked boy jumped over the pier to tie the little vessel to the port, her excitement knew no bounds. Her father had to hold her back forcibly, kicking and spitting, lest she fall off the side and crash against the rocks. As soon as they were at the pier, her parents asked her with a grin, already knowing her innocent answer, "where do you want to go today darling?". And with her eyes bright and her cheeks red, she said, "My Taj". A beautiful and very unique tribute to the incident! Touching to say the least. "My Taj..." fantasies of the little brains, too good Umang. hmm .. one hopeful thing to say at such times and indeed a big spat on their face.. but these are times to think .. If someone can hold us for more than 48 hrs in our own house .. we are loosing the battle .. moreover how can somebody just come n start shooting around .. ridiculous !! times to think n prolly revamp .. or strike back. I just couldn't let them do that. I too hope so but I don't think its about the lessons we learn, if we make our hotels safe, they'll strike our airports, then its schools, then hospitals and then its our very homes..
@Rakesh..thanks, it really did mean a lot to me as a kid..
but what is the solution? Go into their homes and kill them?? but how do you define who "them" are?? Is it the young child walking down a pakistani street "them"? or is it the muslim woman shopping for her first home them?? Is it the business man trying to figure out the best deal for his company? who is "them"?? yes they will be..but then is that the solution? being shot down..standing up again, only to be blown up the next minute?? "No AK-47 bearing terrorist can kill those smiles or burn those memories..."